Post-industrial revolution human racing to exploit coal mines, oil and gas for the fuel of various production machines and factories. With the "scientific prejudice" man assumes and argues that only with the fuel so the production machines in various industries can be operated and humans can feel the prosperity with various facilities of his life. Fuel consumption is encouraged, so the reserves depleted. In addition, currently within a range that is not too long, it turns out the impact of the "scientific prejudice" of human is already felt, the various environmental problems caused, which can even threaten human life itself. It was for this reason that humans came to the conclusion that fossil fuel consumption should be limited and even discontinued, because it is not environmentally friendly and unsustainable. The phenomenon is similar to the use of chemical fertilizers for agriculture. Chemical fertilizers began to bloom in use around the world after World War II, because it also uses the materials of the rest of the war. Less than 70 years old, chemical fertilizers are now widely contested for various reasons such as health effects as well as the impact on the environment. Another thing that is similar is genetic engineering that produces genetically modified crops (Genetically Modified Crops). In its first appearance in 1994 it was seen as a food solution for the world - it is now still not two decades old now opposed everywhere, as new "prejudice" suggest that GM Crops brings huge potential risks to human health in the long run. Various attempts were made to let go of the fossil fuel trap, which of course was also not easy and faced various problems, so it needs to make a systematic and realistic stages. No less than 24 climate conferences have been conducted and followed by almost all countries in the world. The practice of various countries has different strategies adapted to local conditions. Renewable energy or clean energy has also become a UN target to be realized along with 17 other targets in Sustainable Development Goals (SDGs). Whereas Allah has said in the Qur'an about 14 centuries ago, about the use of fuel from trees as a source of energy.QS Yaasiin: 80, QS Al Waqi'ah: 71-72, and QS An Nuur: 35 and for more explanation detailed can be read here. Only by returning to His instructions and believing in the Qur'an as the answer to all problems (QS 16: 89) then surely man will be safe and happy the this world and akhirat. Trees will be a source of energy for the future. 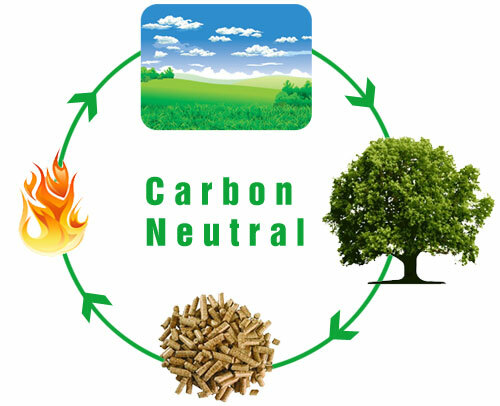 Planataions or energy forests become one of the scenarios for the supply of biomass fuels, especially for the production of wood pellets. Fuel consumption from trees but ignoring the environmental aspect itself will also cause environmental catastrophe. Do not get because human greed with excessive exploitation beyond the carrying capacity of the environment itself then the natural damage even more severe. In addition to providing guidance on the use of trees as an energy source, Allah SWT also commands us as the prosperous of His earth (Qur'an 11:61). How complete and beautiful the guidance from Allah SWT.